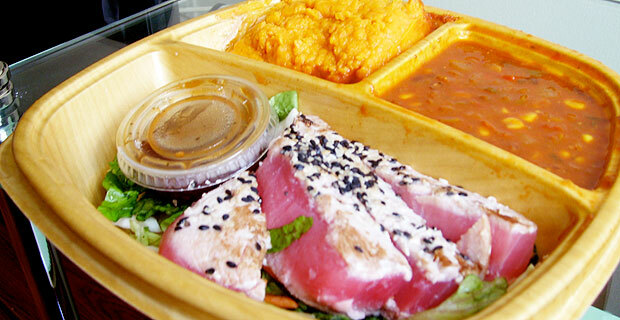 Energy Kitchen's tuna steak proves that ordering in can be healthy. We’ve all had those days. It’s 7 PM, you’ve just come home from work, exhausted, and the last thing you want to do is cook up some food- especially if you’re feeding more than one mouth.Â You consider ordering delivery, but you’re starving and don’t want to wait an hour for your food to get there.Â That’s where we come in. For each installment of Race to My Place, we pit two restaurants with similar cuisines, estimated delivery times and prices against each other to see whose delivery reigns supreme! We compare delivery speed, packaging and presentation, quality and taste, and value. For this health food race, our contestants were Energize Me Foods and Energy Kitchen. After eating greasy take-out everyday for a week, my stomach was begging for a break. I decided to reward it with more delivery, but this time, with health food!Â Today we are comparing two similarly named restaurants, both claiming to serve food that will boost your energy AND keep that spare tire off your midsection. Let’s see if there’s any truth to their claims. The two restaurants serve pretty different items: Energy Kitchen’s food sounds very bland, like you would typically expect from a health food joint. Energize Me Foods, on the other hand, seems to serve more flavorful dishes, such as Caribbean Jerk Spiced Grilled Chicken and BBQ Pulled Chicken. They don’t post their calories, however, so it’s possible that their dishes may not be all that healthy. 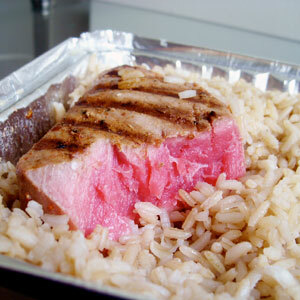 For the sake of comparison, I ordered Grilled Tuna. Energize Me Foods charges extra for any side dishes, but Energy Kitchen’s entrees come with two sides. I ordered their Mashed Sweet Potatoes and their Vegetarian Chili, but I’ll review those items separately to be fair. I was surprised that Energize Me Foods won this race, because their store is located all the way in SoHo. In case you’re wondering, Energize Me is run by Kool Bloo, and they share the same location on 117 Avenue of the Americas. On Delivery.com, their minimum order total is $25, but if you call in your delivery, they’ll allow you to order less than that. Energize Me Foods came in 30 minutes, while Energy Kitchen came in 47, a pretty substantial difference. Can I get some tuna with this rice? Energize Me Foods had a no-fuss approach to their presentation, using standard tin packaging and placing their tuna steak atop a mountain of brown rice that made the fish look tiny by comparison. Energy Kitchen, on the other hand, used really cute trays that kind of reminded me of the Styrofoam cafeteria trays we used in elementary school. They also sliced their tuna and made it look really presentable. Energize Me Foods’ grilled tuna actually had some noticeable grill flavor to it(shocker!). But while the strong flavor was impressive, the tuna was extremely rare and had a fishy aftertaste. Thankfully, the accompanying Tahini sauce provided a welcome compliment to the fishy taste. As for Energy Kitchen’s tuna, it was just plain fishy. And the fat-free toasted sesame dressing that came with it was cloyingly sweet and not a welcome compliment to the fish. Although I didn’t include Energy Kitchen’s side dishes in my ratings, I’m not sure they would have helped. The mashed sweet potatoes were delectable, like healthy candied yams, but the vegetarian chili was soupy and tasteless. As I explained above, Energy Kitchen’s entrees each come with two sides absolutely free of charge. The whole meal costs $12.99, which is cheap compared to Energize Me Foods’ $15.45.Â My biggest gripe with Energize Me is that they charge a ridiculous price for their add-ons. Even their sauce costs an extra $1.50! For this particular race, Energize Me Foods won for its decent delivery speed and better tasting tuna. However, if I could find something on Energy Kitchen’s menu that tastes good, I would order it over Energize Me Foods any day. As far as their claims to “energize you,” I have to say that it’s the absolute truth.Â After eating these dishes, I felt like I could run a marathon!Â It was a pleasant change from the usual sloth-like food coma I go into after eating lunch. So if you’re among those of us who get the dreaded post-lunch sleepies, do yourself a favor and order from one of these guys. You may not run a marathon afterward, but you (and your belly) will thank us anyway.